By Pseudonym, July 12, 2016 in BBC Sherlock General Discussion. Ah, I see your point now. I've always assumed the only reason Eurus said she liked John's eyes was to get him interested in "E" (the woman she was pretending to be on the bus). But maybe she mentioned his eyes (rather than his smile or whatever) because she really does like them. That's certainly possible. I'm not so sure than John actually prefers "dangerous" people, though. He's used to working and living with them from his days in the military, of course, so he's more comfortable with them than most people would be. But I've never had the impression that he actually prefers them. It's my feeling that it simply makes no difference to him -- but that does mean he would be less repelled by her than most people would, at least. Not everyone agrees with me, of course! That's a good question. Non-dangerous people would have less trouble finding friends, I assume, so maybe most of them already have enough friends. "Dangerous" people may say they don't need friends, but I suppose most of them would actually like to have a few friends (despite what they say), but it's harder for them to find friends because most people think they're weird or scary or something. But John doesn't mind, and he's new in town, so he hardly knows anybody. So he ends up with a bunch of "dangerous" friends. He also has some non-dangerous friends, like Mike Stamford -- but we hardly ever see him with Mike. I suspect that's because Mike has lots of friends. I think BBC Sherlock seriously dialed down on John Watson's intrinsic optimism and warm/outgoing nature with people. Their version of Watson is quite an angry, maladjusted and isolated little dude who does not seem to enjoy his calling as a medical man very much. ACD's Watson did, of course, respond to the excitement and danger of being a close associate of Sherlock Holmes, and he thrived on their dangerous adventures together. But the notion that John is so intrinsically damaged himself that he is only attracted to dangerous and damaged individuals is Mofftiss's invention. Mofftiss's rebuilding of Mary from a quintessentially nurturing and proper Victorian wife into a callous ninja assassin was particularly inventive. There's the line where John, devastated by the reveal of his wife's true identity asks Sherlock, "But why is *she* like that? (ie, 'dangeous'). Sherlock's reply: "She's like that because *you chose her*"
This statement does not hold up the evidence of the two preceding episodes since we met Mary. John was completely blindsided by her lethal past and skill set because he'd had no evidence of it in all the months, or years he had known her. Amanda Abbington herself was just as blindsided by Mary's true colors as John was . . and why? Because, the writers hadn't put anything like that *in*. Okay, so she knows what a skip code is and has a good memory for details like hotel room numbers. Many people do. I knew what a skip code is and I never trained with the CIA. I just like to read espionage thrillers. My feeling is, between the introduction of Mary in Ep. 1 and her 'reveal' in Ep. 3, the decision was made to change horses completely on her character. John Watson has Sherlock Holmes for all the danger, excitement and unpredictability he craves. Which is precisely why he would not have to seek it out in a potential wife, not even subliminally. Mary is supposed to represent the well-ordered hearth and home Hobbity side of Watson, while his escapades with SH illustrate his swashbuckling ex-soldier side. Moftiss's version of a Watson who continually gravitates to dangerous, imbalanced people for his primary relationships makes JW on some level, unbalanced . .which I think strays far from the original intent. As you said, John didn't choose Mary because she was "dangerous." She was then passing for "normal," and he chose that. He was likewise smitten with Dr. Sarah Sawyer, apparently a very wholesome woman. So even though the Moftisses claim that he's "attracted to danger," their own story lines don't bear them out. We do see John become a darker character from His Last Vow onwards -- but considering what he's going through, how many people would retain a positive outlook? I don't necessarily think the writers changed their minds, though. Their concept of "fooling" the audience bears a very close resemblance to my concept of lying. Sure, they throw a few feeble "clues" around, but that only shows that they're planning all along to pull the rug out from under us later on. I agree. To my eye, Jude Law looks more like Sidney Paget's illustrations of Watson; Nigel Bruce, David Burke, and Edward Hardwicke look more like Conan Doyle's description of him (in "Milverton"); and Martin Freeman (along with Burke and Hardwicke) resembles him most in behavior (part of that credit goes to the writers and directors, of course, but they can't convey the character to the audience unless the actor is capable). Not to keep bashing the TJLC movement, but I just saw a thing (here) that summed it up nicely: someone did an analysis of the wedding scene, claiming that Sherlock was filmed constantly blocking our view of Mary, which meant that the filmmakers were saying that the wedding was between Sherlock and John. So someone else went in and cherry-picked all the scenes where Sherlock was blocking John … ergo, the wedding was between Sherlock and Mary! Except this person's conclusion was … it doesn't mean anything, it's just what happens when you film someone walking around. And that's how I view most of the TJLC theories … they present only the evidence that supports their conclusion, and ignore or deny anything that doesn't. But that's people for you, I guess. Yup, that's people. We generally mean to be impartial, but even scientists can sometimes see what they want to see, because they're people too. Added: The debunker initially seems to ignore the last part of the original poster's statement: "Mary is, ‘always partly or entirely excluded’, in any shot that also includes Sherlock." 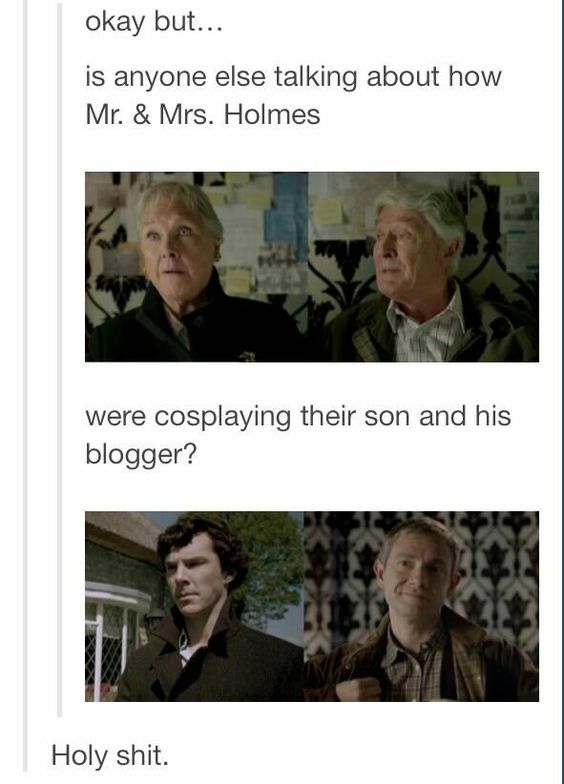 Many of their early examples are two-shots of just John and Mary, i.e., not including Sherlock. But their own explicit cherry-picking at the end makes up for that. Go To Topic Listing BBC Sherlock General Discussion.